The last few weeks have been a fabulous food fest filled with LOTS of holiday classics like turkey and ham, stuffing, mashed potatoes, pumpkin pie, stuffing, stuffing..and more stuffing . Who me? Have a little thing for stuffing? Can you see my “Cheshire cat “big grin…o.k stuffing and I are besties . It’s just such a treat! Dare I say I’ve had enough for a while ? Now I’m feeling the need to get back to more “normal” eating , some filling healthy vegetarian/vegan options. 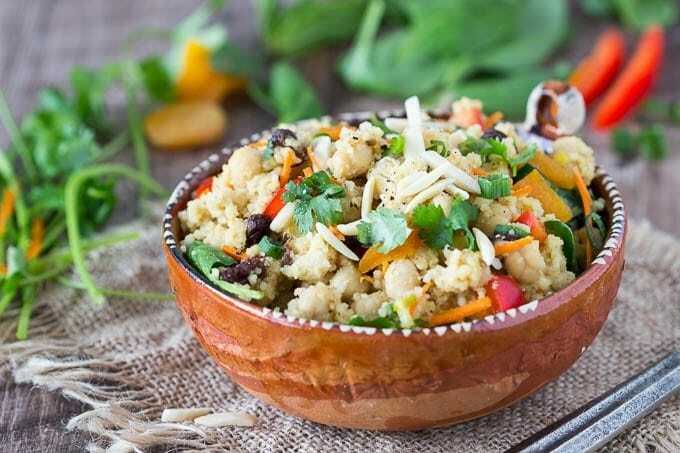 So for todays One Pot Wednesday meal I’m whipping up a quick and healthy Moroccan Couscous. 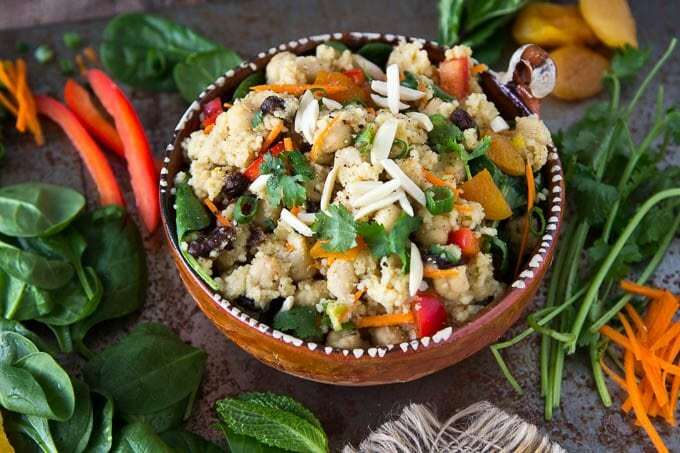 Spiced with the flavors of Morocco (cumin, coriander, ginger, cinnamon and a pinch of red pepper flakes) and loaded with goodies like chickpeas, raisins, dried apricots, spinach, red bell pepper and carrots, this couscous dish will fill you up and fuel you up. 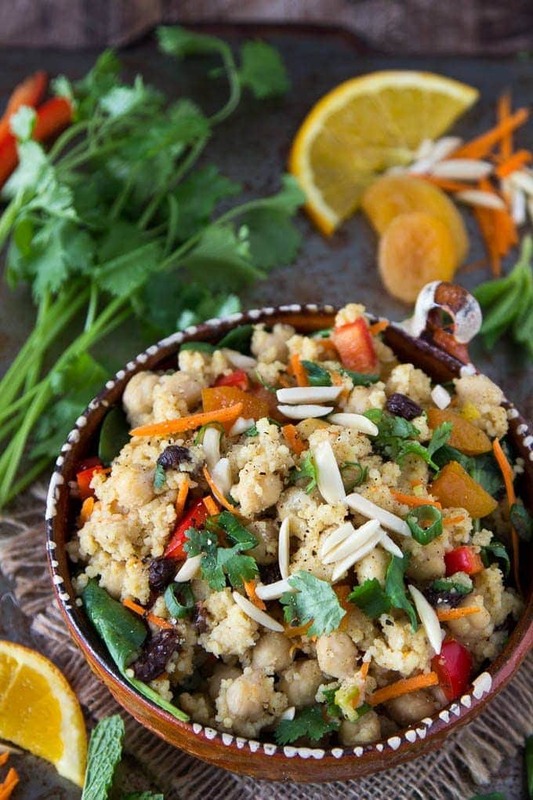 Bonus, you can whip up this Moroccan Couscous in about 15 min. and will only need one pan! How easy is that! Literally you boil some water, add the couscous, raisins and apricots and bring to a boil. Take the pan off the heat and let the couscous do it’s thing for a few minutes. Fluff, add the remaining goodies…and boom! you’re done! A complete meal all in one pot. You’ve got protein (chickpeas), carbs (couscous) veggies (carrots, bell pepper, spinach) and even fruits (raisins and apricots). 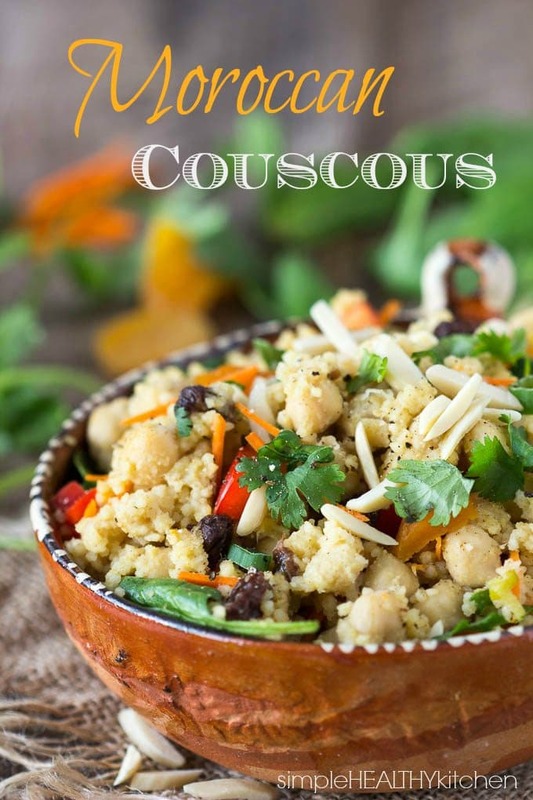 Moroccan Couscous deliciousness! Add water, orange juice, spices (cumin,coriander,ginger,cinnamon, crushed red pepper) and scallions to a medium saucepan and bring to a boil. Add couscous, raisins, apricots and chickpeas. Return to boil. Stir to mix thoroughly. Cover and turn off the heat. Let rest for about 5 min. until couscous has absorbed all the liquid. * I like to add the bell pepper, carrots and spinach at the end so they are crisp tender. If you prefer you veggies to be cooked more, add them at the same time you add raisins, apricots and chickpeas. I sometimes like to add a drizzle of olive oil just before serving. How do you eat the leftovers? Reheat or cold? Chelsea…I actually did both! I added a scoop of the Moroccan couscous on top of some salad greens and a drizzle of olive oil to make a salad and I also reheated in a pan on the stove-top. (I’m sure you could do microwave as well). Hope you enjoy!